ATV Trailers - Buyer's Guide. 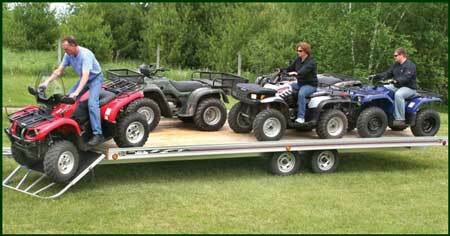 Looking for ATV trailers to haul your ride? Maybe ATV utility trailers to pull behind your four wheeler? That's exactly what our Trailer Buyer's Guide will help you with. No matter if you just need an ATV receiver hitch or want to know about the latest aluminum 4 wheeler utility trailer - we're here to help. Find out why aluminum trailers like this one are becoming more popular. Full guide to the many styles and types of pull behind trailers for UTVs and ATVs. Learn about the different axle configurations, the suspension systems, and the most common styles of trailers. Find out about the many types of specialty trailers and what they do. Everything you need to know about Aluminum Trailers for ATVs. Learn about the pros and cons, the best design features, and the variety of available models. Lighter weight aluminum trailers make it possible to use smaller, more fuel efficient tow vehicles. For whatever the reason, they've been gaining popularity lately. Definitely worth a look if it's time for a trailer. What are the top features you need? Side load trailers for your ATV do have some advantages. Our article tells you what they are, along with tips to help you decide if they're worth the extra cost. Match the work you need to do with the best dump trailer for the job. A tilting dump trailer let's you handle those chores when a wheel barrow just isn't enough. There's a lot more variety than you might think, though. We'll explain all the different styles and features so you can decide which one is best for you. Detailed trailer plans for your own multi-purpose utility trailer. 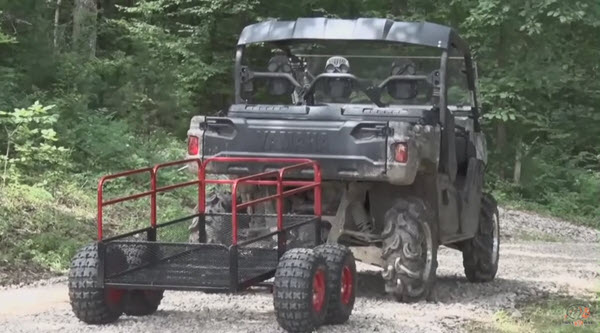 If you need a way to transport your ATV why not build your own trailer? Check out these great deals on utility trailer plans and sources for the best prices on trailer parts. Follow these plans and you'll not only have a great trailer for hauling your ATV, but a utility trailer that's useful for many other jobs. We recommend the best buys - and tell you where to find them! Great values from the best manufacturers. 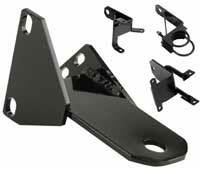 These ATV hitches can get the job done with no worries about bending or breaking. Made in the USA with top quality materials and workmanship. Check out our recommendations for the best values! Check out our picks for the best values in standard trailer hitches. We did an exhaustive search for the best ATV hitch deals - and we're ready to share the results with you!